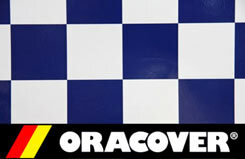 All Products > "5523696 2Mtr Oracover Cheq Wht/Dk Blu"
The professional model aircraft covering material. No slackening, wrinkling or sagging in sunlight - plus legendary strength and puncture-resistance! This excellent polyester covering is highly temperature UNCRITICAL during application making it easy to use for all R/C model aircraft projects. As ORACOVER is ironed on, it's integral adhesive melts onto the wood to guarantee a dynamic bond. However, when ORACOVER is removed it does not leave layers of tacky colour pigment over your ribs or veneers because the pigment layer is not part of the adhesive layer - thanks to the Advanced Multi-Layer System that integrates these layers.